In London once more, via Lisbon, from Mashonaland and South Africa, in early February 1892, Theodore was a minor celebrity. He had come home with crates of finds from ‘Great Zimbabwe’ and a theory that no one for the moment could gainsay about prehistoric southern Arabian influence, trade and power – exotic Sabaeans, or Minyans or Himyarites, using the coastal sites of what is now Mozambique, to transport from their bases in central Africa to their cities in the southern Arabian peninsular shiploads of gold, ivory, spices, and slaves. Research by Theodore in London and in the Lisbon archives, and correspondence on inscriptions and possible architectural similarities between features in Mashonaland and Marib (Yemen), introduced Theodore to the little-explored interior of Ethiopia, and its evocative ‘capital’ Aksum (Axum), about which a slight but resonant body of evidence had been assembling for several decades pointing to the possibility of links between early trading networks and cultures comprising both east and west shores of the Red Sea. Having decided on his field of research for his 1893 season Bent had the usual preparations to see to. There would be no funding this time from Cecil Rhodes but Theodore secured financial support from the British Museum (in return for any artefacts), the RGS, and the British Association (particularly the Anthropological Section. Luckily, as it turned out, for the ‘scientific man’ there were no volunteers on this occasion. The Bents’ Ethiopian expedition of 1893 was their last not to provide facilities of one sort or another for the gathering of floral and faunal specimens or data, necessitating additional materials and transport as a result. There was, however, an indispensible member of the team still to summon. The Bents will have wired, via no doubt the Telegraph station on Sýros in the Cyclades, to their Greek assistant Manthaios to pack and make ship for Port Said. ‘As good as ever and as great a comfort’ – so Mabel writes in her letter of 17 March 1893 – Manthaios Símos (c. 1845 – c. 1935) served the Bents for fifteen years, having first set eyes on him in a smoke-filled Náxos room in January 1884. If the couple were hoping for a stable geo-political situation on arrival at the Italian sea-base of ‘Massowa’ early in January 1893 they were to be disappointed. In a letter to the RGS (19 February) Theodore confides: ‘In fact at that time it looked almost hopeless, and we nearly decided to go off to Suakim, but the Governor encouraged us to wait a few weeks’. Thus, and not for the first time, the expedition soon found itself in some physical danger – caught between the new Italian colony’s efforts to establish itself and the brewing unrest between the warlords of Ethiopian Emperor, Menelik II. As dangerous then as now, the Bents could hardly expect a British rescue force to ride to their aid. With protracted investigations at Axum their goal, the Bent party proceeded at a slow pace to Asmara from the coast to await an understanding from the various Ethiopian authorities that it was safe for them to travel on to Adwa and beyond. They were held up at Asmara long enough for them to make a detour north to Keren, but were eventually allowed on to Adwa (in communication the while with the major figures on the Italian and Ethiopian sides, who were slowly manoeuvring in a deadly trajectory towards a devastating – for the Italians – defeat outside Adwa on 1 March 1896. But the massacre at Adwa is three years away and the Bents make the most of their stay there in February 1893, despite uncertainty about the rest of the trip. Never ones to be idle Theodore and Mabel ride out five hours to the village of Yeha. Here Theodore makes one of his two major contributions to the archaeology of the region by associating a known ruined structure with an early temple, and the site itself with ancient Ava. He also took copies (‘squeezes’) of a number of key inscriptions. Although unclear in his interpretations his work on the site still features in the bibliographies of modern theorists who wrestle for an understanding of the various Aksumite and Pre-Aksumite cultures in the first and second millennia BCE and associations with peoples of the time on the opposite coast of the Red Sea to the east, and the Nile region to the west. Theodore’s remark that the incident was ‘quite the most unpleasant experience we have had during any of our travels’ (although they experience similar difficulties in the Wadi Hadramaut the following year) was British understatement – they could all easily have been captured, with little hope of rescue. Back on the coast, Theodore and Mabel visit the well-known remains near Zula of ancient Adulis, some 60km south of Massowa, and findspot of a famous inscription by Henry Salt in the early 19th century. Bent was well aware of the site from references in Greco-Roman literature, and into modern times. Still not fully explored Adulis remains fascinating in terms of any understanding of the early development of the wider region (including commercial activities generally in the Red Sea) from the mid-first millennium BCE to the Islamic period of the seventh century. However the Bents were unprepared for protracted digging at the site – they spent one night there and had no time to excavate. It was time, March 1893, for the Bents to return to Massowa and pack for England. As usual, the couple were carting interesting items to bring home – either as souvenirs, or at the request of museums, or for their personal disposal at a later date. The Yeha inscriptions could not physically be removed, but the Bents (as the illustrations in The Sacred City of the Ethiopians bear witness) did manage to obtain a not particularly precious collection of religious artefacts, musical instruments, ornaments and clothing; perhaps the prize acquisition was the naïve painting of the Crucifixion now in the British Museum. Theodore began his written commentary on their Ethiopian expedition as they were travelling. He wrote letters to his contacts at the RGS, and directly to the Illustrated London News, sending them two articles, one of which was published in two parts over consecutive weeks, including his own drawings. It was to his book, The Sacred City of the Ethiopians, that Theodore devoted the summer of 1883, and by Christmas it was published. The reviews were many and generous, with special note being taken of the author’s illustrations and Mabel’s efforts as expedition photographer, especially the monuments from Axum. 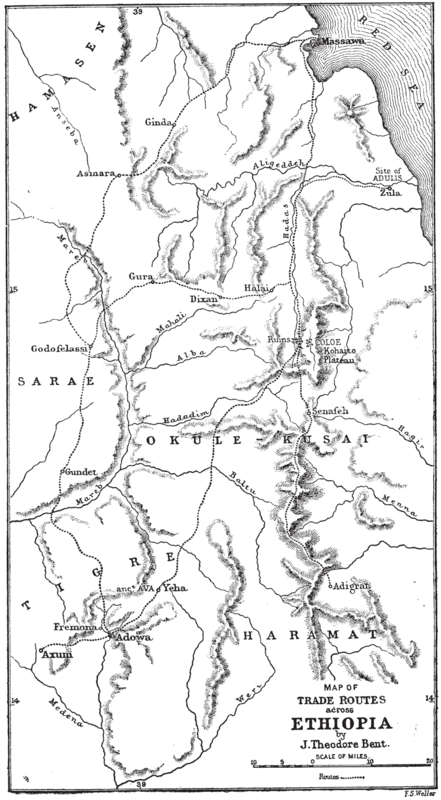 Theodore never returned to ‘Abyssinia’ but it was his first-hand experience of the monuments of the Aksum region, following directly on from his investigations at ‘Great Zimbabwe’, that fired his imagination about possible early contacts spreading outwards from Southern Arabia, from the wadis of the Yemen and, particular, the wastes of the Hadramaut.